Now in its tenth year, Tables for Tots utilizes the talent of local architectural and design professionals to raise much-needed donations for families in need. 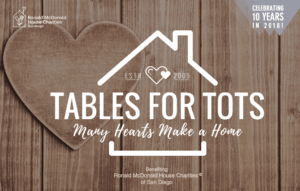 This year, Pacific Building Group is proud to be the 2018 “Heart of Gold” sponsor for the event, organized by Ronald McDonald House Charities of San Diego. Leading up to the event each year, local architectural and design firms are given an unfinished child’s table and two chairs to transform into an “adventure” piece for children. The pieces are then sold during the event, with all funds given directly to Ronald McDonald House Charities of San Diego. Over the past nine years, the event has generated more than $400,000 for Ronald McDonald House Charities of San Diego.